Just lately I've been pondering on needing to get back into practising 'notan' more if I want to have a go at linocutting. Which in turn has made me think a lot about "two value" drawings (or "two tone" drawings for those who prefer to use the term "tone" rather than "value"). Here's the definitions for those who get confused as to the meaning of value and tone. I'm going to use 'value' in this post. Value - An element of art that refers to luminance or luminosity — the lightness or darkness of a color. This is important in any polychromatic image, but it can be more apparent when an image is monochromatic, as in many drawings, woodcuts, lithographs, and photographs. This is commonly the case in much sculpture and architecture too. tone and tonality - A quality of a color, arising from its saturation (purity and impurity), intensity (brilliance and dimness), luminosity (brightness and dullness), and temperature (warm and cool); or to create such a quality in a color. To tone down is to make a color less vivid, harsh, or violent; moderate. To tone up is to make one become brighter or more vigorous. Tonality can refer to the general effect in painting of light, color, and shade, or the relative range of these qualities in color schemes. Then I saw Sarah Wimperis's fabulous Training Session post yesterday on Watermarks - which shows how she produces simple value sketches in winter using big pens in black, brown, grey and white on cardboard while sitting on a beach staring at the Atlantic in Cornwall. Its -12C with a windchill of -26 and I'm standing on the edge of a cliff at 7:45am watching the sun rise over the Atlantic ocean. Yikes!!! Both Sarah and Jeanette made me think about how to get values down fast when sketching outside in winter. You don't hang about when it's cold. I know my local bit of water is not quite so impressive as the Atlantic but I certainly don't hang around for long when sat on the very cold steel seats at the Ecology Park Pond! So how to get (a) assess values fast and (b) get them down on paper fast? 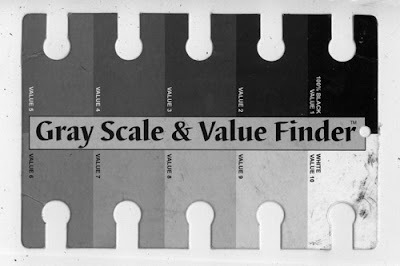 I've got a Scale and Value Finder which is produced by the The Color Wheel Company. You can see mine above - it's a bit battered! To give you a sense of size it's 4" x 6" which means it's big enough to be useful and small enough to just slip inside the back pocket of a Moleskine sketchbook. It's excellent for being able to assess the value of different colours which a lot of people find very confusing. I know I certainly do at times! The advantage of having the cut out bits is that you can sort out what value the different 'big shapes' are. While indoors, you can do the same thing if drawing or painting a still life. If you trust the values seen in a photograph (which frankly I don't - cameras almost always distort values) then you could place it over a photo and assess the value of colour that way. However if you want to use a photo for drawing from, you can adjust the values you see in a photo if you've used a value scale to make a note of the real values 'on the spot' either just before or just after you take the photograph. You really don't have to get an accurate drawing done to be able to create an annotated sketch which tells you what value the key areas/shapes are. Training your eye - as Sarah says - is another important way of being able to assess values accurately without a scale! But you do need to draw a lot from life and/or use value scales a lot to be able to do that well. A good way to work out whether you're making progress is to decide what value you think some object or shape is BEFORE you hold up the value scale to the object only - and then you can see if you're making progress with the accuracy of your visual assessment. I always find it very useful to find the lightest light - and assess how close to pure white that is - and then do the same thing in relation to the relationship between the darkest dark I can see and pure black. Using a set of greyscale markers is another way of making yourself think about values when sketching. Lindsay Olson (Non Linear Arts), another member of Watermarks, has a useful post on her blog a while ago about How to use markers. I'm going to do a further post later in the week (probably Friday) about how to use the cutout tool in PS Elements to produce a guide to seeing two values and producing simple two value 'drawings'. All as a preliminary to my learning how to do lino-cutting! and finally....... a small toot! I'd very much like to thank all my subscribers and regular readers for visiting this blog. This morning saw the arrival of the visitor who pushed the count to over 400,000 unique visitors to this blog in the last three years. Plus the blog has also notched up more than 1,300 subscribers for the first time. Great prod to get back to values! And congratulations on your lofty visitor numbers, so well deserved! Perfect post and an excellent tool to get back to basics. I've been reading a lot lately about value studies but from a painting point of view. All the books I have read lately say that for painting the landscape in oils (in a painterly way) that you should reduce your values to at most 5 preferably 4. They all emphasise the value of making value studies before doing a painting. As well as the tonal scale this is a good idea. An art teacher once taught me to look at the scene through a piece of coloured perspex (red is best apparently, possibly because it neutralises the greens?). This makes the scene monochrome and less confusing to assess than looking at lots of colours, even through half-squinted eyes. Also, if you look at my portfolio website you'll see a very useful tool called a Val-U-Viewer which has red perspex and which Sally Strand the pastellist recommended to me. well thats a useful bit of kit, and congrats about the stats. No suprise tho as your blog is a constant fountain of useful info, well done. Wow, talk about serendiptiy!....I am in a bit of a research phase, before embarking on this years landscape paintings! Just this afternoon I was looking George Inness's paintings, which are a great insperation, this lead me on to the Tonalists! I am also reading Carlsons Guide to Landscape painting. Having read a few art books in my time, I have to say this book is packed with great info! Cant wait to get out there and get painting!...great post! I hope not to be repeating something that you've said but would like to add that there are also viewfinders with a red viewer which turns colours into a greyscale, if I'm not mistaken since I've never used one. Congratulations on your numbers, quite impressive, especially for an art blog. Jose - as Shirley observed above, the red perspex/acetate removes colour and renders whatever you look at as monochrome (ie in grey scale format). That's what can be seen on my website. On its reverse it has a grey scale which allows you to match the grey scale values you see through the perspex to the printed values on the border. Hi Ed - nice to see a Suffolk artist here! :) Carlsons is a good guide - it covers lots of the basics. Thanks - don't forget to come back for the post about PS Elements and the cutout tool on Friday! forgot to mention earlier that the piece that goes with this post is outstanding! Katherine, you have a gift for assembling and prsenting information in user friendly ways! Thanks for a great post and for mentioning my blog! My, that post was burried! 25th January 2009 - Who's made a mark this week? 18th January 2008 - Who's made a mark this week? Do you need an art dictionary? 11th January 2009 - Who's made a mark this week? 4th January 2009 - Who's made a mark this week? MAM Poll: How often do you post to your blog?